You've played in enough hit-and-giggle tournaments to know what it's like to have the par 3 with the prize on the line for an ace. Sometimes the prize is equipment, others a trip. Occasionally it's a car. But not often is the prize cold, hard cash, nor do you have to use a specific ball to make the hole-in-one. That's what makes the Volvik Hole-in-One Challenge unique. At any golf course, a pre-registered player is challenged to make an ace using a Volvik DS-77 golf ball. 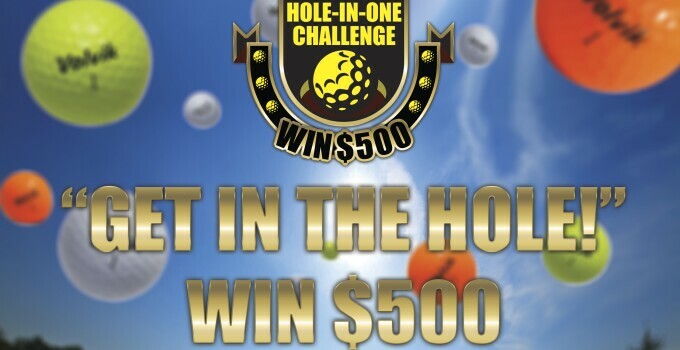 If a player holes out, they win $500. It's that simple. Joe Bowdwitch became the first to do complete the challenge at a Billy Casper Golf facility. At Sun 'N Lake Golf Club, Bowditch aced with a yellow DS-77 and a 5-iron. Pre-register today and pick up a sleeve of Volvik DS-77 golf balls to have a chance at $500 on every par 3 you play between now and June 30, 2015.